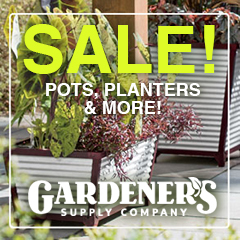 When you’re ready to get serious about growing flowers, herbs and plants in outdoor garden planters, one of the first items you need is a sturdy, roomy potting bench. This potting bench is not fancy—but very rugged and functional. It is also very easy to build and use—except it doesn’t have any legs! Don’t panic, having a legless potting bench is actually a benefit, I’ll get to that a little later. Here’s a short list of what you’ll need to build this rugged, functional potting bench. Tools: A screwdriver, a small box wrench or crescent wrench, or if you have a 1/4″ drive socket set that’s even better. A tape measure, a small square, a drill, and a power saw. Materials: One full sheet (4′ by 8′) of 3/4″ treated plywood. Make sure it is treated so it will last a long time. Untreated plywood does not hold up well at all outdoors. 15 dohickeys (you know, those little metal angle brackets, or corner brackets used to connect two boards together at a right angle. These metal brackets are bent in a 90 degree angle and have two holes drilled in them. 30 bolts with nuts 1-¼” long, and the correct size to fit the angle brackets you buy. Before you start, draw this out on paper so you know exactly what each piece of wood is supposed to look like before make any cuts. This way you won’t make a mistake that will ruin your piece of plywood. Lay the plywood on a flat surface, like your garage floor. From one end measure in 16″ and draw a line across the sheet of plywood. With your saw, cut along this line. The piece that you are cutting off is 16″ by 48″. Now draw a diagonal line across the smaller piece of plywood. (The one you just removed from the sheet.) Cut along this line. You should now have two triangular pieces that measure 48″ on one side and 16″ on one side. These pieces should be in the shape of a right triangle. Now you are going to remove a small piece from the pointed end of the triangular pieces. To do this, measure 24″ from the right angle, along the 48″ side and make a mark. Using a small square draw a line from this mark across the pointed end of the plywood. This line should be at a right angle to the 48″ side of the board. This line should only be about 4″ long. Cut along this line, removing the small piece from the pointed end. Discard the small piece you cut off. The piece you have left should be 16″ on one end, 24″ on one side, and about 4″ where you made the cut to remove the pointed end. The two smaller boards you have left should be identical. These are the sides for your potting bench. Now back to the larger piece of wood. This piece should now measure 80″ by 48″. From the long side measure over 16″ and draw a line from one end to the other. Cut along this line. The piece you are removing should be 16″ by 80″, leaving a piece 32″ by 80″. These two pieces will serve as the bottom and the back of your potting bench. Take the back piece and stand it on edge, on top of the piece that will serve as the bottom of the bench to get an idea of how your potting bench is going to fit together. Make five marks where you will mount the angle brackets that will hold these two pieces together. Just space the five brackets along the two boards, making sure not to put any too close to the end so they don’t interfere when you install the two end pieces. Just keep the brackets about 1-½” from each end. Note: Once you have the brackets installed and the bolts all tight you might want to cut off the ends of the bolts and file them smooth if they are sticking out so far as to be a hazard when you are handling the potting bench. Once you have all five brackets installed and the back of the potting bench mounted to the bottom, you can then install the two side pieces. With the two side pieces installed you are now the proud owner of a legless potting bench. You can install legs if you’d like to, but I like mine without legs because I can get it much closer to my pile of potting soil. Rest one end of the bench right on the pile of potting soil, and then support the other end with a saw horse, concrete blocks, or milk crates. By placing one end right on the soil pile, it is very easy to shovel the soil onto the bench. Not having legs also makes the bench easier to store and move around. Author: M. J. McGroart – www.freeplants.com.